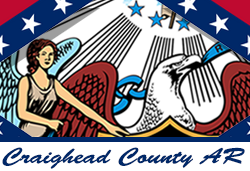 Looking for a job in Craighead County Arkansas? The following is a directory of top employers in Craighead County Arkansas. This guide includes local city jobs, hospitals, schools. and job posting boards. Craighead County's primary cities are Bay, Bono, Brookland, Caraway, Cash, Jonesboro, Lake City, and Monette. Jonesboro is the economic engine and retail hub of Northeast Arkansas. Only sources that have job listing pages, business directories, and/or legitimate human resources contacts are provided below. Craighead County's employment section is at the bottom of their home page. During review there were openings for Legal Support Specialist and District Court Deputy Clerk. The Sheriff's Department was hiring for the position of Certified Deputy Sheriff. Check for new listings. The City of Jonesboro was hiring on this review date. Open positions found had included Animal Control Officer, Kennel Master, Part-Time Laborer, VISTA Community Development Specialist, VISTA Community Outrreach Officer, VISTA Organization and Volunteer Specialist, Intern for Human Resources, Internship, Part-Time Transit Driver, Facilities Maintenance, Softball Coordinator, Police Officer, Equipment Operator I, and Equipment Operator II. My Jonesboro Jobs is an excellent resource to use for searching jobs and to post your resume. A search of opportunities revealed a high volume of potential jobs like Victim Services Advocate, Skilled Tradesman HVAC (Heating, Ventilation, and Air Conditioning, Plumbing, Electrical, Carpentry, and Mechanical), Mental Health Therapist, Instructor, Administrative Specialist, Maintenance Technician, Sales Jobs, Housekeeper, Licensed Practical Nurse LPN, and Human Resource Assistant. Visit their site often for new listings. The Jonesboro Regional Chamber of Commerce is a good resource for developing job leads. The member directory lists area businesses. Jonesboro Unlimited can help you to identify key industries, view demographics information, and cost of living data. Note: Some of the largest employers include Arkansas State University and St. Bernard's Healthcare. These employers are listed under education and healthcare categories that are displayed lower on this page. St. Bernards Medical Center is the largest employer in Craighead County with over 3,000 employees. St. Bernards job board is an excellent resource to monitor frequently. A survey of jobs found on this review date included Hot Job! APRN Newborn NICU, Hospital Nurse RN, Registered Nurse RN, Licensed Practical Nurse LPN, Patient Access Rep, Certified Scrub Tech, Urology LPN, Certified Nursing Assistant CNA, Hospital Cook Jobs, CV Tech, Rad Tech, Hot Job! Dietitian, Dual Specialty RN Critical Care Nurse, Hot Job! APRN Medical Staff, Floor Tech, Hospitalist, Dialysis Nusing Jobs, Monitor Tech, Medical Records Facilitator, Maintenance Jobs, MRI Tech, Nuclear Med Tech, Pharmacist, Pharmacy Technician, Ultrasound Tech, Registered Nurse SICU, Oncology Nursing Jobs, Psychiatric Nursing Jobs, Mental Health Tech, Psychiatric LPN, Psychiatrist, APRN Medical Staff, Scrub Tech, CRT NICU, Mental Health Associate, Housekeeping Jobs, Phlebotomist, and Telecommunication Operator. NEA Baptist Memorial Hospital is a fully-integrated 192-bed, state-of-the-art hospital that employs approximately 1,900 people. Open positions found on this review date included Housekeeper, Full-time Registered Nurse, Licensed Practical Nurse LPN, Pharmacy Technician Jobs, Surgical Technician, Medical Technologist, Occupational Therapist, Registered Nurse Day Shift, Nuclear Medicine Technologist, Pharmacist, Medical Assistant Jobs, Physical Therapist, PRN Housekeeper, Surgical Technologist, Front Office Clerk, and Registered Cardiac Echocardiographer. St. Elizabeth's Place of Jonesboro, Arkansas specializes in providing short-term transitional rehabilitation services and long-term care services. During review there appeared to be a number of opportunities available. Posted listings had included Activity Director, Administrator, Assistant Director of Nursing, Business Office Manager, Certified Nurse Assistant CNA, Charge Nurse, Dietary Department Aide, Dietary Department Cook, Dietary Manager, Director of Nursing, Floor Technician, Housekeeper, Housekeeping/Laundry Supervisor, Laundry Worker, MDS Coordinator, Treatment Nurse, Personnel Director, and Medicare Manager. Craighead Nursing Center provides 24-Hour Skilled Nursing Care. During review, Craighead Nursing Center had an announcement on their contact page that indicated they were hiring Certified Nursing Assistants, Housekeeping positions, and Licensed Practical Nurse LPN. Check for updates. Ridgecrest Health and Rehabilitation of Jonesboro, Arkansas specializes in providing short-term transitional services and long-term care services. During review there appeared to be a number of employment opportunities posted. Encompass Health Rehabilitation Hospital provides rehabilitation services and in-home skilled nursing therapy and special programs. Openings found had included Environmental Services Aide, Rehab Therapy Tech, Nutrition Services Aide, Rehab Nursing Tech, Registered Nurse (Pool), LPN/LVN (Pool), LPN/LVN (Pool), Registered Nurse (Full-time/ 7p-7a), Nutrition Services Manager, and Nutrition Services Aide (Part-time). Jonesboro Public Schools was hiring. Employment opportunities found had included P.E. teacher/ P.E. Monitor, Substitute School Nurse (RN or LPN), District Maintenance Position, School Counselor or Social Worker, Physical Education/ P.E. Monitor, P-4 Certified Elementary Teachers, Mid Level Math Teachers, Mid Level Literacy Teachers, and Special Education Teacher. Nettleton Public Schools had employment opportunities such as Pre-K Teacher, Baseball Coach, Social Studies Teacher, EAST Facilitator, Secondary Math Teacher, Paraprofessional, Special Education Teacher, Secondary Certified Teaching Jobs, and Elementary Certified Teacher. Riverside Public Schools was building a new website during this review. Visit their site to navigate to their employment section. Brookland Public Schools was hiring for the positions of School Bus Driver and Resource or Self-Contained Teacher. Westside Consolidated School District had a number of vacant positions that included Special Education Paraprofessional, Food Service Worker, Substitute Nurse, Custodian, Bus Driver, Future Administrative Positions, Future Classified Positions, and Future Licensed Positions. Valley View School District's open positions included Future Paraprofessional Positions, Substitute Nurse, Future Paraprofessional Positions, Future Maintenance/Custodial Positions, Future Bus Driver Positions, Future Secretary/Bookkeeping Positions, Future Food Service Positions, Future Certified High School Positions, Future Certified Jr. High Positions, Future Certified Intermediate Positions, Future Certified Elementary Positions, Future Administrative Positions, and Future Substitute Positions. Arkansas State University offers a vast array of ongoing employment opportunities. This is an excellent resource to monitor. A survey of open positions found included Administrative Analyst, Assistant Professor, Childcare Technician, Computer Support Analyst, Childcare Technician, Heavy Equipment Operator, Instructor, Public Safety Officer, Skilled Tradesman, and Tenure Track Assistant Professor.